This year was a peculiarly shaped one for romantic comedy: crowded at the bottom and dominated by a few solid winners at the top, without a whole lot of interest in the middle. On the downside, there was a preponderance of heavily promoted execrable why-did-they-bother? fare (Good Luck Chuck, License to Wed). The merely mediocre appeared and disappeared with all the substance of a forgettable dream (Music and Lyrics, No Reservations), while well-intentioned misfires (Waitress), bland Masterpiece Theatre (Becoming Jane) and unconvincing self-indulgences (Catch and Release) failed to make a mark. Best Female Lead in a Romantic Comedy: Who knew? As drop-kicked into public consciousness as she was into a 3-D universe in Enchanted, Amy Adams brought an inspired can't-get-enough-of-her innocent silliness to Princess Giselle. She made a cartoon character so lovably real, we can't wait to see her as a human heroine. Most Valuable Player in a Rom-Com: If only she'd had an actual character to play in Knocked Up, Katherine Heigl would've been a cinch to grab Best Female Lead honors. As is, against all odds she brought conviction and cred to Judd (I Don't Get Women) Apatow's movie, and thus became 2007's Meg Ryan replacement front-runner. Best Future Tom Hanks: Welcome, Michael Cera, the infinitely watchable Young and Decent One in two coming of age/romantic comedy hybrids this year, Juno and Superbad. Already a less-is-more champ whose mere presence guarantees interest, Cera surely possesses "that thing" in spades. Best Male Lead in a Rom-Com: He'd already broken a mold with his eccentric uber-geeky 40 Year-Old Virgin, but with Dan in Real Life, Steve Carell proved that he could do normal, too -- or at least, excel at the kind of healthy neuroticism that our genre demands from its leading men. His reaction shots alone in Dan gave more bang-for-the-shot than say, the whole of Ben Stiller's screen time in Heartbreak Kid. Best Rom-Com Ensemble: Really a romantic dramedy, Why Did I Get Married? had a solid cast (Tyler Perry, et al) rendering less than stellar material more involving than it might have been. Best Featured Performance in a Rom-Com: Good Lord, but Kristen Wiig is funny. Her lively deadpan deliveries as Katherine Heigl's stricken-with-envy, acid-tongued workplace superior in Knocked Up brought new meaning to the concept of irony. Best Performance in a Rom-Com Trailer: Though I only read but with any luck will never see the current soaper rom-com P.S. I Love You, heroine's buddy Lisa Kudrow stole the trailer; critics say she did the same with the movie. Hottest Bellamy in a Rom-Com: The Bellamy (i.e. Wrong Guy/Girl for the protagonist) has rarely seemed so va-va-voom as the one woman who could make even Juliet Binoche anxious: Emily Blunt in Dan in Real Life. Best Rom-Com Couple: Actually a combo of performance and good writing is responsible for this year's left-field win. While no big screen coupling reached A Pair for the Ages status, the sweet, funny, wish-you-could-hang-out-with-them romance between Pam and Jim (Jenna Fischer and John Krasinski, full writing credits here) on TV's The Office was definitely the highlight of a movie couple chemistry-challenged year. Best Cute Meet: When a couple "meets cute" in your standard romantic comedy, contrivance often abounds. That's why Steve Carell and Juliet Binoche's bookstore encounter in Dan impressed me as the most believable, could-actually-happen sparks-starter -- with laughs -- on screen in 2007. Best Rom-Com Set Piece: A tie this year between Enchanted's "let's tweak every walk-in-Central-Park movie cliche you've ever seen" That's How You Know musical number, and Paul Rudd and Seth Rogen's Samuel Beckett-on-shrooms confrontation with The Most Meaningful Hotel Room Chairs in the Universe, in Knocked Up. Best Song: There was plenty of musical comedy rom-com this year (I'll dutifully acknowledge High School Musical 2, etc. 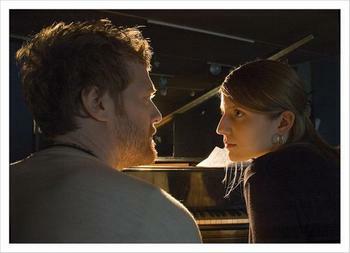 ), but by far the most moving, stunning, soul-grabbing performance, albeit in a romantic dramedy, was by Glen Hansard and Marketa Irglova, Falling Slowly into could-be-love in a music store, in Once. Best Rom-Com Screenplay: From its clever why-didn't-I-think-of-that?! high concept to its perfectly tossed off one-liners, Bill Kelly's witty, wise script for Enchanted delivered more than the necessary goods, saying hello to romantics of all ages under the guise of lightweight kiddie fun. Best Direction: Currently batting 2 for 2 as the Next Big American Comedy Auteur after his debut Thank You For Smoking, son-of-a-great Jason Reitman helmed the winning rom-com hybrid Juno with the kind of tonal assurance and visual panache that you so often want and rarely get in a character-driven dramedy. Biggest Rom-Com Disappointment: The Dude, What Happened?! statuette goes to the brothers Farrelly this year, as they managed to subvert The Heartbreak Kid, a perfectly viable Neil Simon black comedy into a mean-spirited not-so-funny misfire, largely by assuming today's audience wouldn't root for Ben Stiller as an anti-hero. 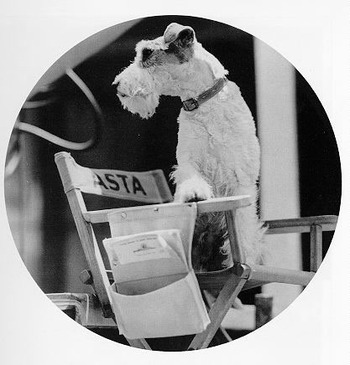 Audience stayed away anyway, since the fatally actor-protected, too tinkered-with script just didn't work. Bravest Failure: Leave it to Chris Rock to explore turf that other comedic icons might fear to tread. His Eric Rohmer meets Hip-Hop I Think I Love My Wife, full of as many missteps as it had good laughs and insights, at least had the courage of its quixotic convictions. Best Musical Romantic Comedy: From its terrifically over-the-top Happy Working Song (featuring singing and dancing water bugs, no less) to the afore-mentioned That's How You Know, Enchanted is the one we'll be seeing as a hardy perennial for years to come. Best Romantic Dramedy: A sleeper that I reckon will soon be an acknowledged classic, Once has already been too over-hyped to hype once more. But let's just say this about that: after having seen The Swell Season live (that's leads Hansard and Irglova, now a real-life couple, on tour w/band), I fervently hope to see them sing Falling Slowly on the Oscars -- and take one home as well. Best Bromantic Comedy: Thank you New York Times for official coinage ("bromance, a strong relationship between two heterosexual men, which combines "bro," from brother, and romance"), and Justin Shubow from the National Review for putting his finger on the trend. I'm running with it: this was a strong bromantic comedy year. From I Now Pronounce You Chuck and Larry to Superbad, healthy hetero men were declaring their warm and fuzzy feelings for each other like, a lot. The foreign entry My Best Friend would get my vote for best bromantic relationship, but there was one even stronger (and stranger) on the homegrown front. 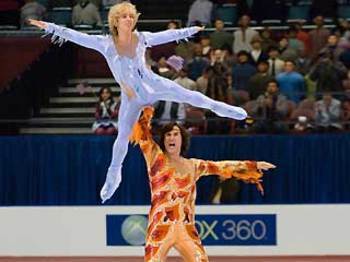 How will we ever forget (though we may try) the spectacular ice capade love fest between Will Ferrell and Jon Heder in Blades of Glory? Best Romantic Comedy: Badly flawed? Yes. A matter of taste? Sure. Sexist? Yuh-huh. Even though I despaired over this movie's giant gaping plot hole (i.e. you never really see the two leads fall in love), I'm tired of having to defend Knocked Up. A writer-director friend put it best: "Yeah, she never would've gone for that guy in a million years, and there's no way they'd end up together as a happy couple... but thank God she did and they did, because it was HILARIOUS." Amen. My honey, as politically correct as they come, has taken to compulsively watching the DVD, and I get sucked in every time I find her at it, because the gags are laugh-out-loud, capital-f Funny (and the performances are uniformly fabulous). For all its wretched excesses and contrived improbabilities, no other romantic comedy spoke to its audience as resoundingly as Judd Apatow's monster hit, the hands-down not even vaguely arguable Definitive Date Movie of 2007. It's about us in the 2000s -- or at least the boy-man problem that afflicts a portion of our culture. With any luck, the King of Raunchy But Sweet will next deliver great roles for women as well as shlubs, but for now, love him or hate him, Apatow's our man. That's my story and I'm sticking to it, and I'm ready to hear yours: what did I get wrong or right in the Astas this year? Living RomCom wants to know.